I recently heard a great question – Do you want to go help, or do you want the people to be helped? That puts things into perspective – and it helps you discover the true motivations for a potential trip to a developing nation. If the trip is more about you than it is about the long term effects you will have, that’s okay. Be honest about that. But also be honest about the risk of damage to the people living in the poorer countries you wish to help. Are they equipped to maintain it? Is maintaining a building the best use of their time? How many local jobs could be created if it was built by the local community? Often what is created is a feel good experiment that doesn’t last. And when it falls into disrepair and needs to be rebuilt, people raise money, fly over and build it again. Sustainability has become a bit of a catch phrase in development over the years, and for good reason. It is vital in any work that gets done. If we want to see long term change, it needs to be based on sustainability. If none of the locals are receiving training and education as part of the process (and I mean real training and education, from a qualified person, not someone who has watched a few videos on YouTube) then the alleviation of poverty has become solely reliant on those who travel from distant lands as they rescue the poor, powerless, helpless people. If they decide to stop coming, people stop receiving help. In the long run that leaves them worse off than they were before because now they are dependent upon others and have not been given the opportunity to come up with their own solutions. But if we end up thinking that we are the only person in the world who cares, and that through our efforts we alone can fix poverty, then we have become the Messiah to poor people around the world – in our own minds. Wealth does not automatically equate to wisdom. People don’t need to be rescued. They need to be given the chance to fulfil their potential. Just because we have the means to fund something or to visit a place, it doesn’t mean we should automatically do that. Children are the most vulnerable in any community and they are the ones that get hurt the most when we don’t think about what we’re doing. Even those who seek to help children might indeed be harming them and treating them as a commodity. For example, just taking photos of children we meet when we travel to poverty stricken areas can turn their struggle into a tourist attraction which, apart from being unethical and an invasion of privacy, can lead to kids staying away from school to try and earn a few dollars by “selling” their photo. Children are not a commodity. Take photos, but do it respectfully and ethically. Seek permission from a parent before you make them the focus of your photo shoot. The same should be said for randomly picking up and hugging kids too. Let’s face it, if you wouldn’t do it in Australia then you probably shouldn’t be doing it overseas. It can also stunt the emotional development of children. It’s not healthy for children to have groups of people come for short periods of time and build ‘life-long’ friendships with them, only to have them disappear without a trace and never see them again. I cast my mind back to the Education Revolution from the Rudd government in Australia from 2007-2010. For one part of the program, the Federal Government put aside billions of dollars for schools across the country as a way to equip them with facilities required to ensure quality education levels for all Australian children. There was a catch though; there were restrictions on what the money could be used for, there was a time limit in which the schools had to apply for the grants and then another time limit by when the building needed to be started. 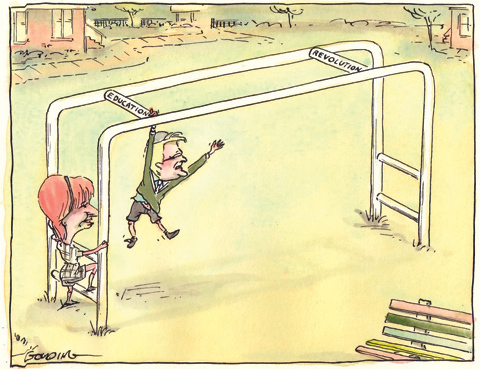 Long story short, thousands of schools throughout Australian got brand new undercover multipurpose sporting facilities, usually the size of a small basketball court, which were not well thought out or even essential. But a decision was made at a national level about what was necessary for education. No one bothered to ask the schools, lest the needs of a primary school in Mandurah, Western Australia would be different to that of a secondary school in the inner suburbs of Sydney, New South Wales. In the same way, when we think about what people living in developing countries need, isn’t it possible that what will benefit them the most is a little different from what we think they need, based on our experience in Australia? The real question is, what do those who are living in poverty actually need? When we find the answer to this, and find out what is best for them then we look to find a way to initiate lasting change that brings people out of poverty and allows them to reach their full potential. More often than not, the only people who can answer these questions are the very people we are looking to help. And depending on who you talk to within the community, you may get different and sometimes conflicting answers. That is why it is best to communicate to all members within a community – older, younger, families, male, female to get an insight into the needs that they all have. After consultation with the community, come up with a plan which may include elements of sustainable access to clean drinking water (including sanitation and hygiene), better food production, healthcare, education and increasing social capital within the community. Building a school will not achieve all of that. Digging a well won’t do it. Nor will whacking a coat of paint on an orphanage. It may be part of the larger plan but why does it take white faces to do those things? So, with all that being said, it’s important to note that I advocate for broad, extensive and systematic change within governments and communities around the world, to assist in alleviating poverty. I also advocate for helping the person right in front of you, and I believe that these two positions are not mutually exclusive.